A thorough physical exam and detailed explanation of the problem followed by recommendations for treatment. Your primary care veterinarian should have already faxed us any laboratory tests and patient history. You should bring any x-rays that have been taken. Can I wait for my pet during surgery? We prefer that you don’t wait for your pet during surgery because surgical procedures and recovery time can vary for each pet. Dr. Malnati will contact you as soon as your pet is finished from surgery. Whether your pet says overnight is generally up to you. Some clients prefer to take them home and some would prefer to leave them here the night after surgery. Dr. Malnati always wants to see his patient the day after surgery. If they do go home the night of surgery then he will have you come back the following morning to see how things are going. Dr. Malnati will give you his cell phone number when you pick your pet up after surgery so that you will be able to contact him directly if you have any questions after hours. Generally, your pet should have no food after 6:00 PM the night before surgery, but normal water consumption is allowed. We will provide you with more specific instructions during your initial exam. What happens when I bring my pet in the morning of surgery? Dr. Malnati will examine your pet again and answer any further questions you may have. Then we will prepare your pet for surgery and the surgery will be performed as scheduled. Dr. Malnati will call you after surgery. If your pet stays overnight, usually we will ask that you call the next morning at 8:30 to check in on your pet, and to confirm that he or she is ready to go home. At that point we will coordinate with you when to pick up your pet. Do I follow up with Sunset Veterinary Surgery, or my regular veterinarian? Follow up for the problem referred for will be done at Sunset Veterinary Surgery. Any unrelated problems will be handled by your regular veterinarian. Will you provide my primary care veterinarian with an update? Dr. Malnati usually calls your primary care veterinarian after your pet goes home and will always send your veterinarian a letter describing what was done. A copy of the post operative instructions that were given to you will also be given to your veterinarian. Each case is different and requires different at home care after surgery. You will receive detailed instructions when you pick up your pet. You will also have an opportunity to discuss with Dr. Malnati any questions you may have about your pet’s post operative care at the time of discharge. No, you do not need a referral. However, your primary care veterinarian will be kept informed of any surgical procedure that was performed. Will I have an opportunity to ask Dr. Malnati all of my questions? Yes. Dr. Malnati will give your pet a thorough examination and discuss with you the different treatment options for your pet. It is very important that all of your questions are answered. A well-informed owner who understands the procedure and aftercare is very important for the successful outcome. Do you treat all species? We treat only dogs and cats. How long will the recovery from the surgery take? Recovery times will vary depending on the severity of the original problem. Generally, the aftercare period is about 2 months for orthopedic procedures and shorter for soft tissue surgery. What aftercare must I do? You will receive detailed written instructions when your pet goes home based on your pets surgical procedure. Each case will be different. For most leg surgeries, usually there is no running, jumping or playing for up to two months. You may have to give antibiotics and pain medicine two or three times daily for about a week. When you are not home, he/she should be in a crate or confined space. When outside they must be on a leash at all times. Fees are always discussed prior to surgery and they vary with the procedure and length of time in the hospital. 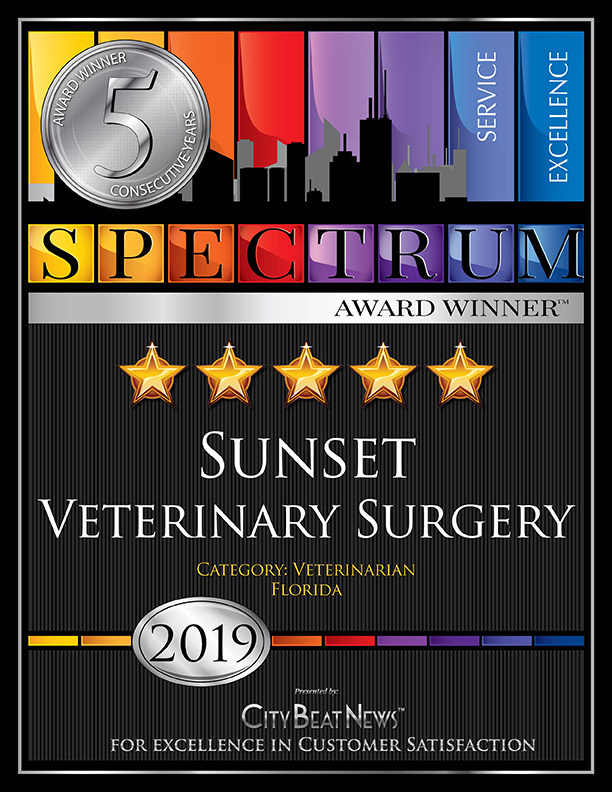 Dr. Malnati understands the stresses involved in all decisions surrounding your pet’s health care and recovery and Sunset Veterinary Surgery ensures that there will be no financial surprises. We do not carry credit ourselves but accept the major credit cards as well as Care Credit, that is designed as credit for health care issues. What is your most common surgery? Knee surgery. Both ruptured cranial cruciate ligaments (same as ACL rupture in people) and patellar luxation (kneecaps out of place). How long will my pet have to stay with you? Most pets do better at home in a familiar environment than here at the clinic. Some clients take their pets home the same day (Dr. Malnati can be reached by cell if needed) but we like to see them the next morning. Most of the time, they come in the morning of surgery and go home the same day. At times a patient may have to stay longer but this is unusual. Will there be a bandage? Typically the area will be bandaged the first night only. Most patients do not bother the sutures but if they do, an Elizabethan collar can be used. Will I see the same doctor every visit? Yes. Dr. Malnati is the only doctor in the practice. The practice is designed to give personal attention and care to each client and patient.